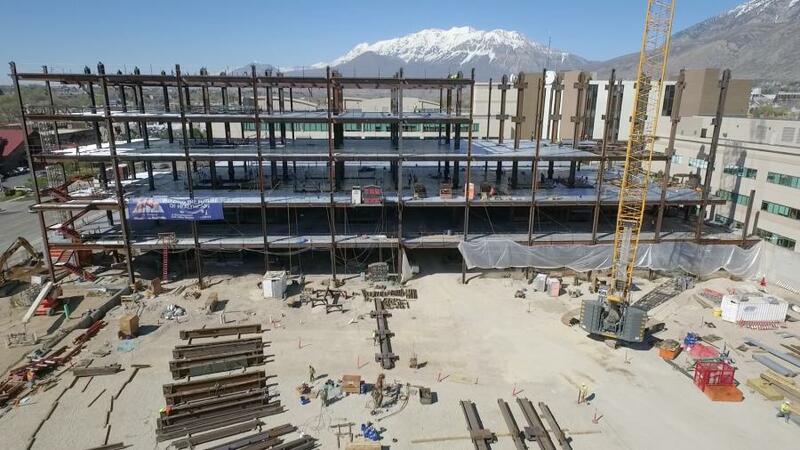 New buildings are taking shape at a $429 million replacement project at Utah Valley Hospital, formerly Utah Valley Hospital, in Provo. The existing buildings are nearing the end of their use and will be replaced by two large structures, a new inpatient tower called the Pedersen Tower and an outpatient building called the Sorenson Tower. Once completed, patients will receive treatment in what hospital officials described as one of the most technologically advanced and modern hospitals in the country. Groundbreaking for the hospital replacement project took place on June 17, 2015, kicking off construction of the two major replacement buildings. 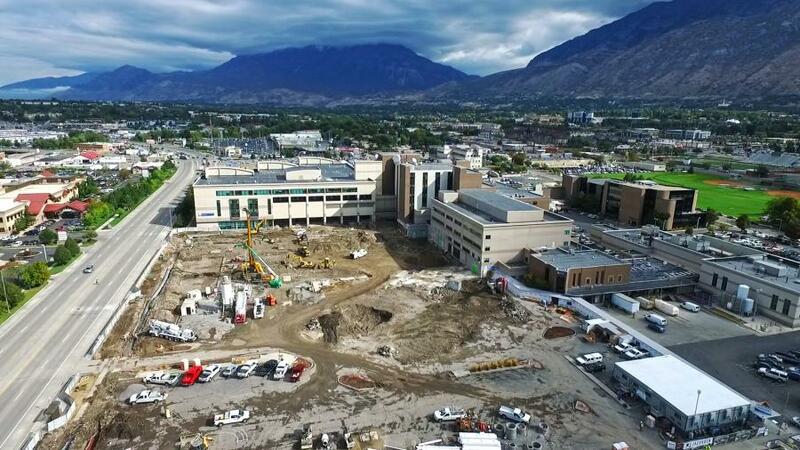 “The Sorenson Tower will be completed in February 2018, with the Pedersen Tower being completed in November,” said John Rohatinsky, Replacement Project lead for Utah Valley Hospital. The project is funded through bonds (50 percent), patient revenue (40 percent) and philanthropy (10 percent). General contractor for the replacement project is Jacobsen Construction of Salt Lake City, a fast-growing builder and contractor. 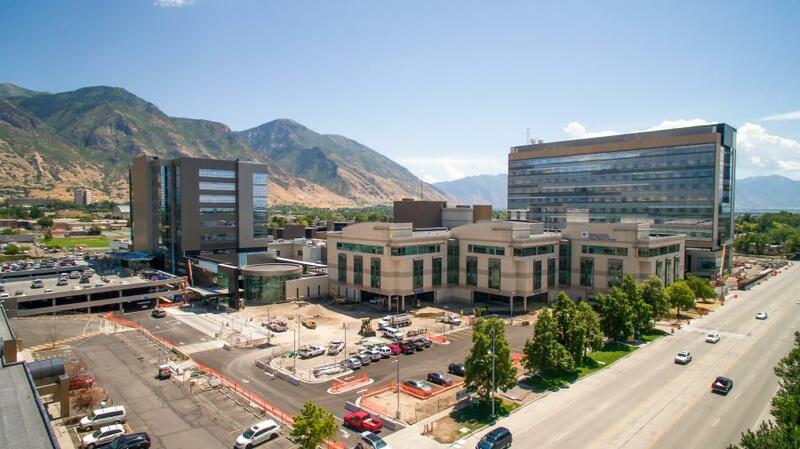 Through a bid process, Jacobsen was awarded the highly-complex expansion of Utah Valley Hospital, which, when completed, will transform the largest hospital in Utah County into an updated, world-class facility that can provide quality care to the ever-growing area. 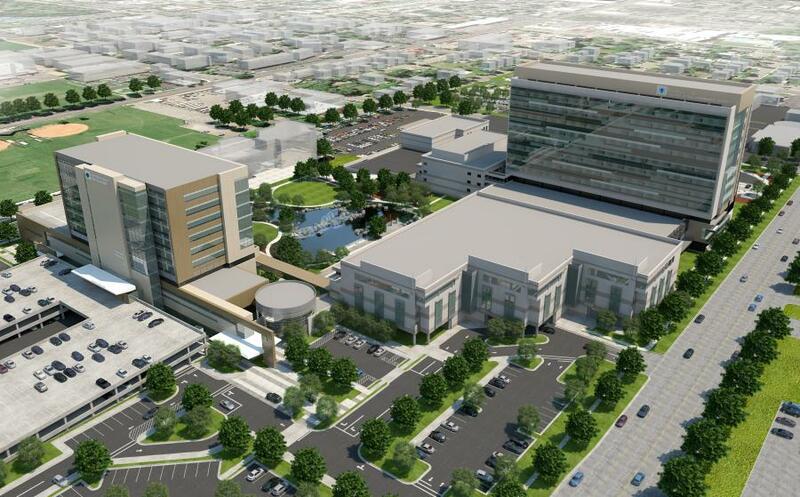 Utah Valley Hospital's existing seven-story inpatient center will be replaced with a 12-story, 590,000 sq.-ft. tower, which will aggregate various departments currently scattered throughout the campus. HDR Inc. of Omaha, Neb., is the architecture firm for the replacement project at Utah Valley Hospital. Major subcontractors for the project include Sunroc of St. George, Utah; Taylor Electric Inc. of Salt Lake City; J & S Mechanical of Draper, Utah; SDI (Standard Drywall) of San Diego; Cache Valley Electric of Logan, Utah; and Pacific Cabinets of Salt Lake City. New parking lots have already been constructed. Once the Sorensen Tower opens and becomes occupied another building will be demolished to make way for more surface parking. Heavy equipment on site includes bulldozers, backhoes, graders, delivery trucks, dump trucks and cement trucks. Cranes were in place for more than a year and were recently removed as workers completed tower exterior work. The project has required heavy use of construction materials. The Pedersen Tower foundation is 48 in. thick and required 4,530 cu. yds. of concrete to complete. The concrete for the foundation was delivered in one day by concrete trucks. The foundation also required 780,000 lbs. of rebar. The Pedersen building itself needed 8 million lbs. of steel framing. In terms of soil, dirt was moved out when the foundations were dug for the new buildings. Additional dirt will need to be removed to grade a new parking lot in spring of 2018. “We are transitioning to an innovative patient-focused design with caregiver stations immediately outside each room,” Rohatinsky said. Patient-focused design helps reduce medication errors, patient falls and hospital-acquired infections. Institutions are finding that patient-focused hospital design improves their bottom line while raising patient satisfaction. Live videoconferencing: Live, two-way interaction between a person and a provider using audiovisual telecommunications technology. Store-and-forward: Transmission of recorded health history through an electronic communications system to a practitioner, usually a specialist, who uses the information to evaluate the case or render a service outside of a real-time or live interaction. Remote patient monitoring: Personal health and medical data collection from an individual in one location via electronic communication technologies, which is transmitted to a provider in a different location for use in care and related support. Mobile health: Health care and public health practice and education supported by mobile communication devices such as cell phones, tablet computers, and hand-held personal computers. Applications can range from targeted text messages that promote healthy behavior to widescale alerts about disease outbreaks, to name a few examples. Also, each patient room will have views of Mount Timpanogos on the north, or Utah Lake and the Payson Mountains on the south. Energy efficiency also is part of the design. Both replacement buildings will be LEED Silver certified. The replacement hospital will feature 232 hospital beds in the new inpatient tower and 383 total beds campus-wide. On the exterior, the new buildings will be steel structures with concrete slab floors. A few of the existing buildings will be retained rather than replaced. That includes the Mother-Baby building and the Utah Valley Outpatient Center, which houses a surgical center, lab and imaging modalities. The current inpatient tower, Cancer Center and Emergency Department buildings will be demolished. The facilities will be moved to the new buildings. A garden with an apt title of Healing Garden will be built where the previous inpatient tower stood. The garden will feature outdoor dining, walking paths and a pond. 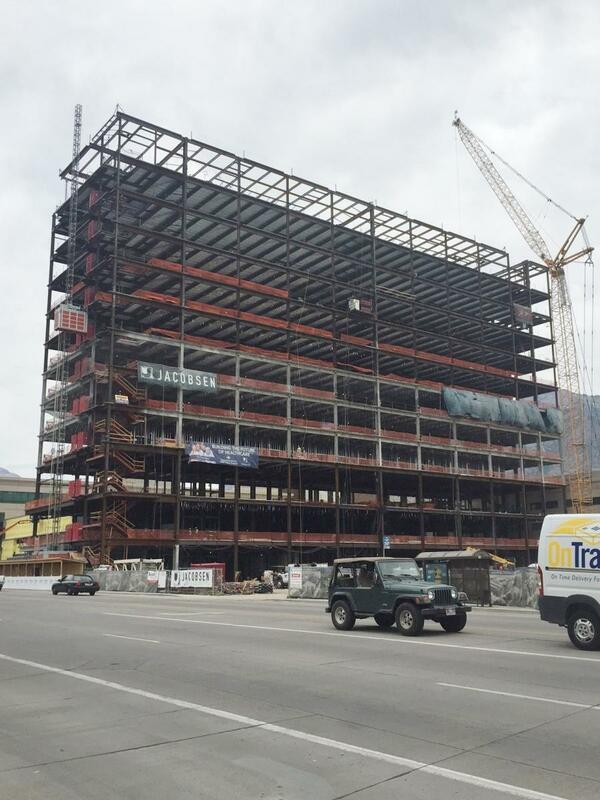 The new inpatient tower is a 12-story, 600,000-sq.-ft. structure that will house various hospital services. The outpatient building will stand nine stories tall and feature multiple clinics and an InstaCare. InstaCare facilities provide licensed physicians and specialized staff that can handle all non-life-threatening urgent care needs, from sore throats and illnesses to cuts or broken bones. The new hospital buildings will provide larger patient rooms, which are all private and include large windows with views of the valley and surrounding mountains. Patient services will be centralized rather than spread across the facility. The hospital will contain “on-stage” and “off-stage” areas so certain hospital operations not directly involving the patient do not disrupt the patient or visitor experience. Educational and exercise space will be provided where patients and their families can learn more about living healthier lives. Stairwells are being constructed that are pleasant to use and full of natural light. Outside, a large pond with waterfall and walking path are being installed for visitors and patients to enjoy. In addition, a new Northwest Parking Lot will be built. 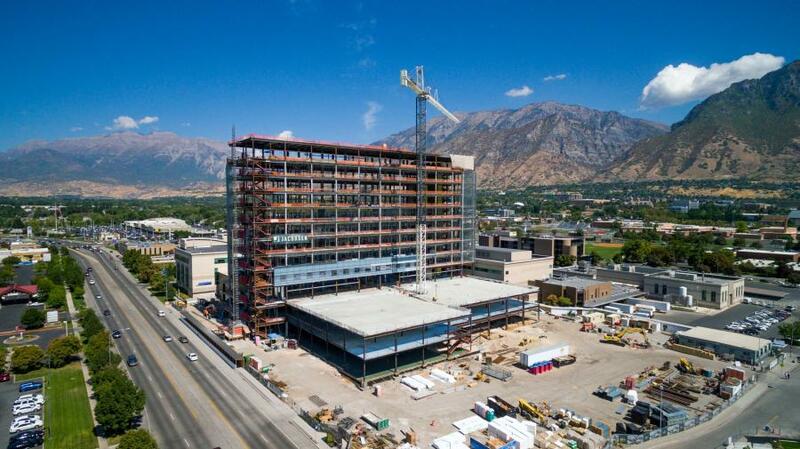 • Completion of Utah Valley Clinic in November 2017. • Demolishing of the Northwest Plaza in January 2018. • Completion of the Northwest Parking Lot in July 2018. • Demolishing of the existing emergency room in November 2018. • Demolishing of the East Tower in January 2019. • Completion of a new loading dock in July 2019. • A new dining area should be ready for use in October 2019. • Workers should finish the hospital's Healing Garden in October 2019. Some homes and businesses are adjacent to the hospital property, but construction impact has not been substantial, Rohatinsky said. “Jacobsen and their subs have done a very good job of minimizing impact and proactively notifying both hospital staff and surrounding neighbors of any noise impacts,” he said. Hospital replacement means updated and improved treatment.